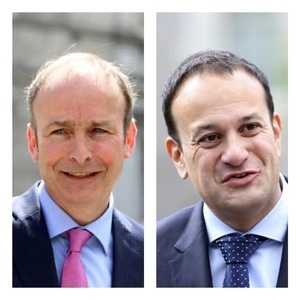 Fianna Fáil leader Micheál Martin has rebuffed a request from Taoiseach Leo Varadkar to open talks seeking to extend the Confindence and Supply Agreement between the parties to summer 2020, with an election to be held then. 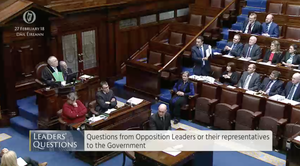 Mr Martin said Fianna Fáil will discuss the review process around the Confidence and Supply Agreement once the Budget is announced next month. Posted in Misc and tagged Leo Varadkar, Micheál Martin at 1:28 pm on September 4, 2018 by Bodger. The worst Taoiseach the country has ever seen. And that’s quite the honour considering the previous incumbents. It doesn’t matter what Fianna Fail do at this point, they are finished at the next election. Much like Labour. If Varadkar wants stability then let him go the people and get his mandate. Election now! Drain the swamp. History will not be kind to Varadker and quite rightly so. Wasters wasters wasters. political filth. And Irish people allowed this to happen. So who will run the country next? SF? They have great governing experience in Westminster, erm, in Northern Ireland, ahem, in the Country & City Councils, erm. In the Dáil? The Independents? Perhaps the Healy-Rays will start a party for the whole country. Yes Cian. they can’t fopp it up anymore then the current crowd of wasters. And maybe a Sinn Fein government is exactly what’s needed to finally focus the minds on the job the electorate want the Government to do. 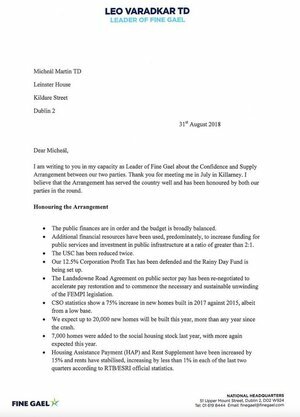 Did you read the letter where Leo listed some of the things that FG have implemented in the last 2 years? They are making some changes. Many would agree that these changes are (mostly) good. What has the SF government done for the last 2 years up North? Nothing – they are not doing their jobs. Oh, and if you think that SF couldn’t fopp it up anymore then the current crowd – then we are in disagreement. [granted, FG are doing/not doing other things that many would consider bad. But no government is perfect]. Will you be running as a FG candidate at the next election? Me? Nope. Why would I? ‘Cause you enjoyed canvassing last time out? As the official spokesperson for FG here on BS I wondered if you’d be taking the next obvious step in your career. 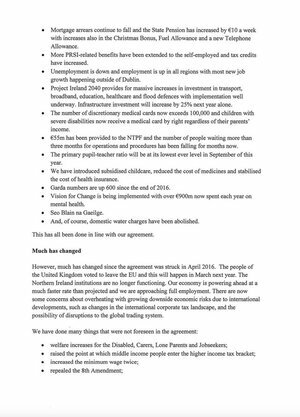 In fairness, he didn’t say FG were finished – but you got away with that lie. Now tell me – after 100 years, give or take, of FF FG LAB, are you seriously trying to say that SF don’t deserve a try in real government – not a rubber-stamper UK government, within the confines of the morsels that the House of Commons deem they should ‘give’ to NI ( DUP and SF). Erm (as you say) what are you afraid of? That some scandals relating to FG FF LAB may surface? Erm? Good point. perhaps he’s in FG, but doesn’t like Leo. Do SF deserve a try? Personally, I don’t like their policies – they oversimplify things and are too populist. Which is fine for opposition – but not in government. They will most likely get into power over the next 3/4 election cycles. But I think they’ll make a mess of the economy and will sink into obscurity. What the bloody hell is this?? Fine Gael are asking (passive aggressive online bullying) the opposition party (not actual opposition because they back the governing party at all cost) into another cozy 2 years of more of the same. They’re not looking to the citizens for a mandate to govern they’re looking to the “opposition” to prop up this ‘confidence and supply’ nonsense. THIS IS FLIPPING ABSURD. Can a governing party bypass the electorate like this? Is this democratic or even legal? We, the people, gave the Oireachtas a mandate in 2016 (that’s only 2½ years ago) which has a maximum term of 5 years. The TDs are free to swap and change the Taoiseach as often as they like during those 5 years. Or, (a majority) of TDs can ask for the Dáil to be dissolved and have a new election. Is this democratic? it depends on your definition of democratic – we live in a parliamentary democracy – so in those terms: yes. I think that Dept of Education should get rid of religion, and have more CSPE classes: people don’t seem to understand the first thing about how the country they live in is run. Well, how it should be run. Well, I have lots of ideas on how it should be run… But people referring to professional politicians negotiating as ‘passive aggressive online bullying’, and asking about their mandate two years into a 5-year term displays a worrying gap in their civics knowledge. The problem isn’t CSPC – it is people. Think of your “average” person-on-the-street. You know, your average voter. Not too smart, not too thick. Just average. Now think – half of the voters out there are as thick, or thicker than this person. Scary thought! Yes I am querying Fine Gaels mandate to govern. Just because they were given a 5 year term does not mean they should get 5 years. Does it? 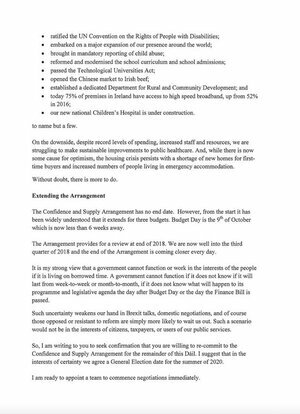 In publishing his letter to Micheál Martin online Varadker is not negotiating he’s pressurising (bullying) Fianna Fáil into continuing the charade of this ‘confidence and supply arrangement’. For the sake (pardon the laughter) of Irelands place in BREXIT negotiations HA! I must have missed the civics class in Parliamentarism for minority governments Rob. The Dáil (not FG) have a 5-year mandate to govern – based on the 2016 election. Who will be in government will be decided by a majority of TDs (not FG). 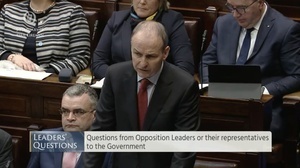 FG + FF can create a majority of TDs – so if a new ‘confidence and supply arrangement’ can be agreed this is sufficient to continue for the remainder of the 5 years. If they can’t come to an agreement, then any other majority of TDs (e.g. FG+SF, FF+SF, various rainbow options) can propose a different government & Taoiseach. If nobody can get a majority, then Dáil is dissolved and goes to election. And the people decide on their TDs for another 5 years. As for the publication of this letter. This *could* also be seen as full transparency rather than bullying. Perhaps you should read the letter again if you think it is bullying. cian is all over this comments section. is cian .. leo? .. FINKLE IS EINHORN, EINHORN IS FINKLE! Cian has skin in the game alright. Letters to the corinthians basically. You SF fanboys have very limited understanding of how our government is formed and operates. No surprises there. It effectively means Fianna fall are both leaders of the opposition and the minor party in government. A functioning democracy requires a credible opposition to put across counterpoints. At the moment we do not have this. Now I get Fianna fall’s fears, if they were in government proper with Fine Gael Sinn Fein would be left as leaders of the opposition. Their popularity would only increase from this. They could promise the earth moon and stars safe in the knowledge that they will never have to deliver them. They love their identity politics and this has put me right off them. Although they are not as bad as the AAA/PBP solidarity or whatever the hell they are known as this week. The current centre-right lite government arrangement that we have now is far from perfect but it could be a hell of a lot worse. This is a tricky one for the FF leader. He has one more chance to be Taoiseach or he’s gone. Does he wait and hope FG dive in the polls in a year or two or does he stop supporting the arrangement that his own party can’t stand. Similarly, does the Taoiseach really want to continue this Government, risking FF triggering an election when it suits them or does he prefer to capitalise on the current poll lead to have an election this autumn? Michéal Martin has no chance of ever being Taoiseach. Ever. We have had a few years of opposition, of which FF are not part of. FF will end up merging with FG ‘officially’. They’ve already merged. Listen to any FFer being interviewed and asked simple questions. A few years ago, they would be gung ho as regards FG. Now? 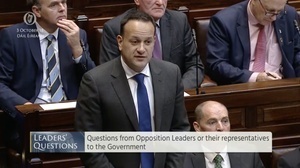 Each and every one of them pussyfoot around the simplest of questions, afraid to bring the wrath of their real leader, Varadkar, upon them. They got back a few of the ‘loaned’ votes that Kenny asked for, last election. The quantity tells it’s own story. But given their performance over the past few years (confidence and supply ? the joke of the century), even those regained votes will ebb away. Sorry, not ebb, they will move permanently away. Once the homeless issue starts to turn they’ll be thinking election.